(but can be completely clueless on other more important matters). Likes her Joe (and her man?) black, her chocolate dark and her food spicy. It amused me to no end seeing Vijay running around our kitchen on my birthday preparing my bash. I figured out what he was cooking despite his efforts to keep everything a surprise, hiding books, flipping over his scribbled recipes and all. This week he'd like to share with you yet another chicken dish (yes, we know, but chicken we love) close to his heart, another homemade recipe from his mother. 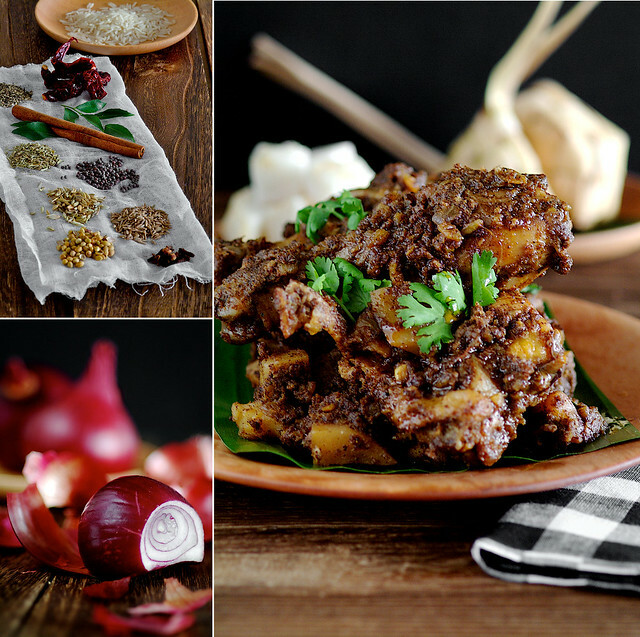 I loved this so much I asked him to make it again on the night before Eid, to serve with the sambal sotong and ketupat I scored from my good friend Naz. How lucky am I to be blessed with a wonderful birthday dinner and last day of Ramadan by a guy who loves to cook? Updated 07/09/2011: Today, on his mother's birthday, Vijay went home to Malaysia and cooked this dish for her. I can't think of a more befitting birthday meal for the creator of this recipe. It was that time of the year again when I had to think of what to do to celebrate Pick Yin's birthday. We’re not getting into presents here, just the festivities for the big day. Since (it's obvious) that good food is an important part of her body and soul, I busied myself on planning to giving her the best experience I could. She had already baked herself the Best Birthday Cake and I knew we weren't going to go in the direction of parties and such. No, it would be a quiet, private affair with desserts and cake after dinner, at the comfort of our own home. I pretty much figured out that she'd really dig something I whip up myself rather than going to any fancy restaurant that we could visit any other day. Oh, don't get me wrong. She does enjoy being pampered in a good restaurant but she always has a finer appreciation for things more up close and personal. The next challenge was deciding on what to cook. I did consult my oh-so-opulent repository of recipes in Deb's Smitten Kitchen. After last year's banging success, how can I not faithfully believe in her? But somehow I didn’t quite feel it this time, although I had my eyes set on a couple of items. You see, the thing is, somewhere deep in the burrows of my head (which Pick Yin may tell you is quite jumbled and finicky most of the time), I had my mind fixed on making one of Mum's signature dishes of 11 herbs and, well, at this point, not so secret spices. The only thing that bugged me about the dish was that it wasn't really, you know, romantic. Everything else jived though, her birthday was during Ramadan and this would set the mood for that. She adores it if I make something out of Mum's wisdom and busy myself in the kitchen like she loves to. And hey, I really wanted to get my hands on making this just as bad. All set. I rang Mum up for the recipe, scribbled down the ingredients and steps on a piece of school exercise book paper I found lying around somewhere and eventually organized them properly onto a print out. Both the scribbled bit and the proper printout was used for high scrutiny reference when I made the dish. Yes, I'm a little very obsessive that way. I worried that I might have missed something I put down myself and therefore needed all that paper flipping, much to the bemusement of my very organized other half, who cooks everything from saved notes or websites on her iPhone. I absolutely love this chicken for its intensity, its look of raw power and the sheer sense of appetite that it invokes. I still remember the first time Mum ever made it. Not being able to finish it as I had taken more than I could chew, I left it in the fridge for later. Afterwards I kept going back to the fridge on and off to pinch bits and pieces off the plate and was awed at the inter-mingling effect of eating spicy hotness that was, really, stone cold. Call me crazy, I'm quite sure I am (as my better half would tell you), but if you love spices and can imagine 11 ingredients coarsely ground to give awesomeness to a chicken while still being able to see the tiny bits of ground elements, you'll have to make this yourself. Recipe from Vijay's mother, Mages. Serves 6 to 8, or 2 with leftovers for the win. Note: While the list of spices for the blend may look rather long, chances are if you do cook with spices they are already in your pantry. A few missing ones shouldn't be a problem so don't go running to store in case you don't have mustard seeds or caraway seeds. The recipe is written for a 1 kilogram chicken, adjust the ingredients according to the size of your chook. To prepare the spice grind, on low fire in a frying pan, fry all the spice blend ingredients until aromatic and slightly brown. Be careful not to burn them. Allow to cool for about 10 minutes. Grind the mix in a spice blender till the desired coarseness is achieved, sieve if necessary. Set aside. 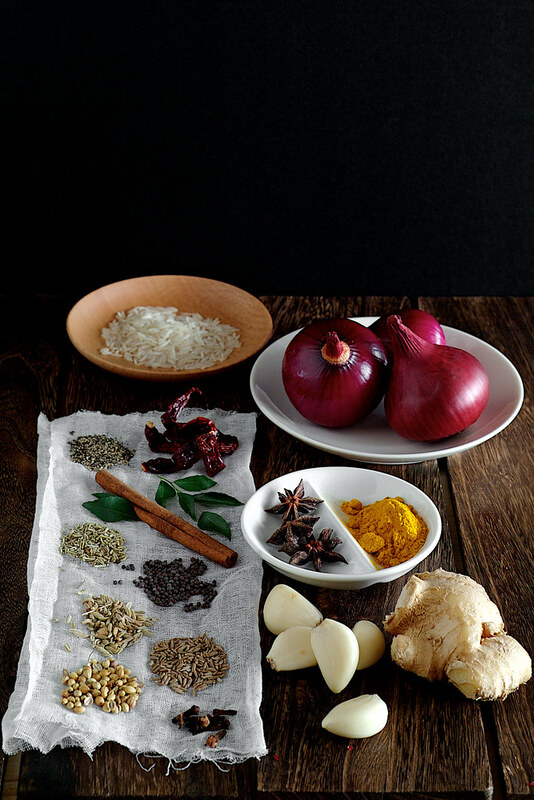 In a food processor or using a mortar and pestle, blend the garlic and ginger into a fine paste. In a large wok, heat up oil over medium high heat. Add in cinnamon, star anise and onions. Fry till onions are translucent and aromatic. Add in the chicken pieces and stir well to mix. Add in the ginger and garlic paste. Mix well to coat the chicken and cover over medium heat, 5-10 minutes until chicken has turn slightly opaque. Remove cover, add in turmeric, spice blend and some salt. Reduce heat to low and toss everything to coat evenly. Add in potatoes and mix well. Cover for another 5-10 minutes. Remove cover, give it another stir and cover again briefly. Remove cover, check chicken and potatoes for doneness and adjust seasoning accordingly. Remove to a serving dish and garnish with some coriander leaves and serve warm with rice, flat bread or ketupat (rice dumpling). Shirley: Ahhh but does your boyfriend like cooking to begin with? If he does chances are you can get him to do it for you right? If not so much then maybe he's not that chauvinistic la... (giving him points here even though we never met, heh...) I'm telling Vijay to make this into a fried chicken alternative, with 11 herbs and spices and all, who needs KFC right? lovely! i am charmed by the effort vijay put into your birthday dinner. like you, i tend to review recipes on my phone or snippets of notes, while my better half has to print out the recipe, organize everything mise en place and then analyse every single step. it's amusing to witness. Lan: Thank you! He really likes to cook, as long as I do the cleanup. On my birthday though, he did everything and I just ate. I'd love cook from recipe printouts and cookbooks actually, the only thing in the way is my small kitchen. I tell you at times even the phone ended up near the stove (!!!) or covered with flour, pastry etc. I am swooning over those photos! So dark, so moody, so delicious! I love all the spices. 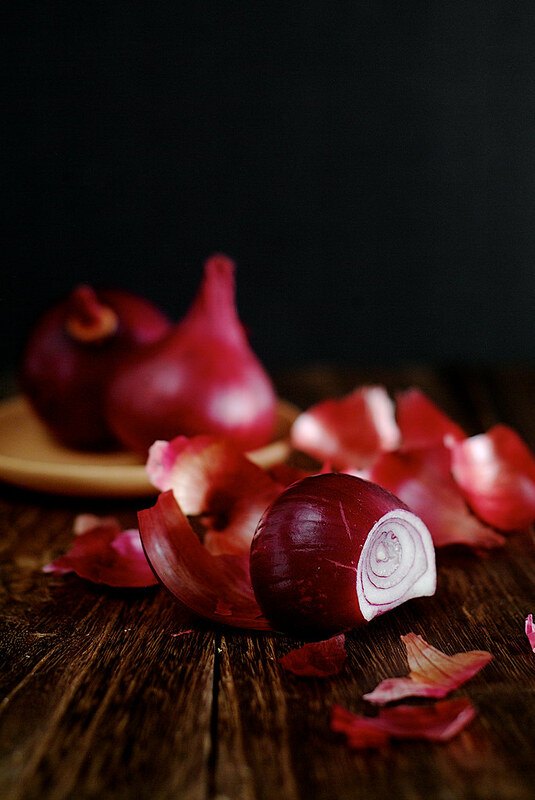 And the photo of the onion is amazing! Lisa: Terima kasih! It's a great way to incorporate spices into a protein dish without adding other stuff like santan, yogurt, milk etc. I think. penny: Thank you! The onion photos are all Vijay's handiwork. 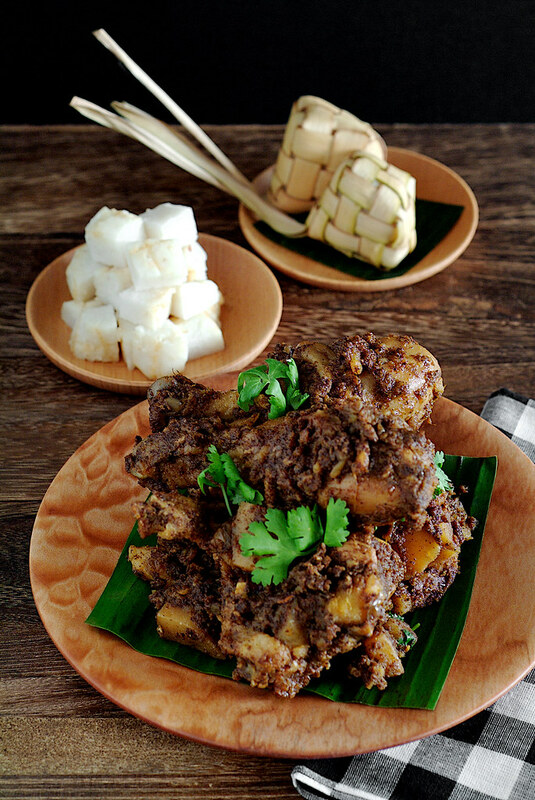 Ketupat just reminds me of Eid ul-Fitr. All the photos are stunning here. I can see some of my fave spices. Pepy: Yup the ketupats were made to celebrate Eid ul-Fitr, so was the encore of this dish. What are your favorite spices? I love them all but my favorite would be fennel and cardamom. That looks so spicy and flavoursome. I can totally imagine eating it with hot flaky rotis. looking absolutely scrumptous! can imagine the aromas in the kitchen when the rempah is being sauteed in oil over a low fire. 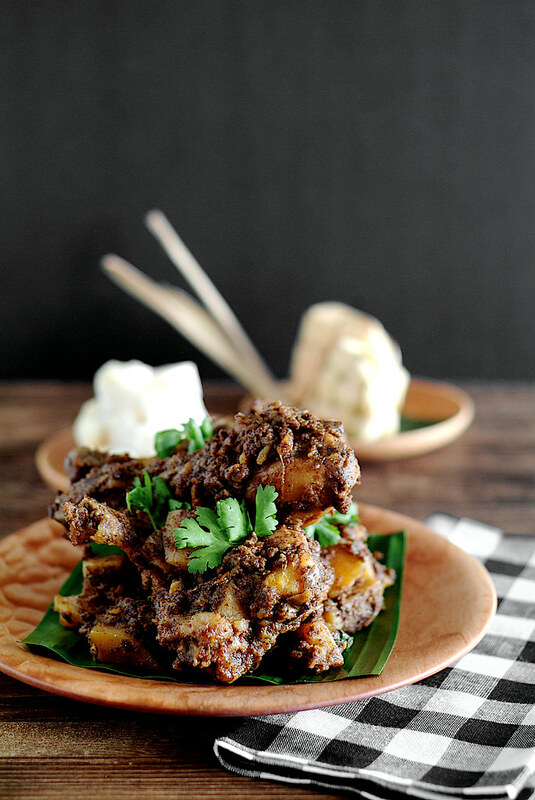 goes really well as a nasi padang dish i think, maybe with a sayur lodeh? you are one helluva lucky woman who has a husband who certainly knows how to pamper his wife. They say the way to a man's heart to through his stomach. I say ditto wife! This looks so delicious! I wish i could try this for lunch. Thanks Anh, hope you can someday try this out. Life Is Great explores the incredible world of food and cooking. We hope to share with you our most delicious moments and inspirations. Copyright© Chang Pick Yin. All rights reserved for post contents except graphics or unless referenced otherwise.